At Style Lottery, we’re on a mission to help people become more conscious consumers. We live in a world with finite resources and if we want to keep enjoying them, we have to become good stewards of what we have. So, what is Zero Waste? A Zero Waste lifestyle encourages individuals to live more sustainably by reducing, reusing, and recycling. It is an extension of minimalism and environmentalism. So of, course we’re all about it here at Style Lottery. I recently switched over to bamboo (Brush with Bamboo) toothbrushes and I loved it! Although I did feel like a hipster brushing my teeth with a wood handle, it felt good knowing that my toothbrush was compostable and would be returning to the earth from where it came. I’m so excited about these toothbrushes that I’m putting them in my family’s stockings this year. As I was moving, I had to decide whether to keep my mountain of mismatched tupperware. I decided glass was a better option because it was more durable and could be microwaved without melting. I also find that glass containers look more aesthetically pleasing when filled with leftovers in the fridge. The price might be a bit higher than plastic, but at this point, I’m looking for a quality option that will last me for a longer time. Glass is it for me. (Hipster tip: Mason jars can also be a good alternative). If you’re someone who likes their food separated, you might want to go for a stainless steel lunch box with sections. I am a juice fiend. I don’t drink alcohol but I drink juice like it’s wine after a long day. I realized that I wasn’t getting enough water. At first, I would fish for some change and would buy some from the vending machine at school. Then I decided to invest in a reusable water bottle. I chose the Takeya brand because it was on clearance at Ross and it was glass! I was worried I would break it or chip my tooth on the mouth somehow, but I’ve had no trouble with it. The silicone case keeps it from slipping out of my grip. To help me drink more water and less juice, I got the free Water Your Body app. It’s the most annoying and useful app on my phone. 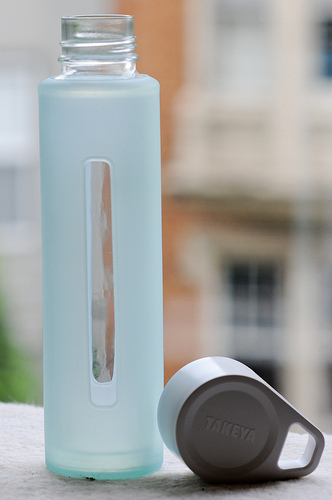 It reminds me to…water my body and keeps track of how much I’m drinking every day. I’m very competitive with myself so I always try to beat my record for how early in the day I can reach my water goal. (Hipster tip: You can use a mason jar for hot and cold beverages). My friend Julia got me stuck on reusable shopping bags. My mom had given me one a year ago and I always forgot to bring it with me to the store. Julia always had hers tucked away in a pocket of her purse. I noticed that she always got the right amount of food for one person because when her bag was full, she stopped shopping. I, on the other hand, shopped like I was feeding a family of five. Something else that helps in this area is going to farmers markets. Not only is it a great way to get the appropriate amount of fresh produce and veggies, it’s easier for you to buy what you actually need. If you need 3 apples, buy 3 and not the jumbo bag of 12. (Hipster tip: bring mason jars to fill with granola or nuts). The hardest thing for me to down-size on was my clothing. In trying to fit all my possessions into 4 suitcases for the move, I realized I had too much stuff and most of it was clothes. It was so surprising and frustrating because hello I’m the sustainable fashion girl! I’m not supposed to have excess clothing. (Those of you interested in down-sizing your wardrobes should check out the Unfancy blog’s Capsule Wardrobe. It challenges you to pick 37 articles of clothing to wear for 3 months. Think you can do it? Check it out here.) I looked through my wardrobe one last time and donated clothing items that I knew I wouldn’t and shouldn’t wear anymore. Two huge piles later, I was finally able to fit all my things into my suitcases. Those of you attending the 2015 Style Lottery swaps will thank me later ;). Donating clothing is a great way to make room for clothes that you actually want. Swapping is an even better option because you give and you get. To check out Style Lottery’s past swaps, click here. FYI: Trash is for Tossers has a great list of Zero Waste Alternatives. See the full list here. Would you try some of these zero waste tips? Let us know in the comments which ones you like and which ones you’re already doing! The Fall semester has been an exciting time for Style Lottery. 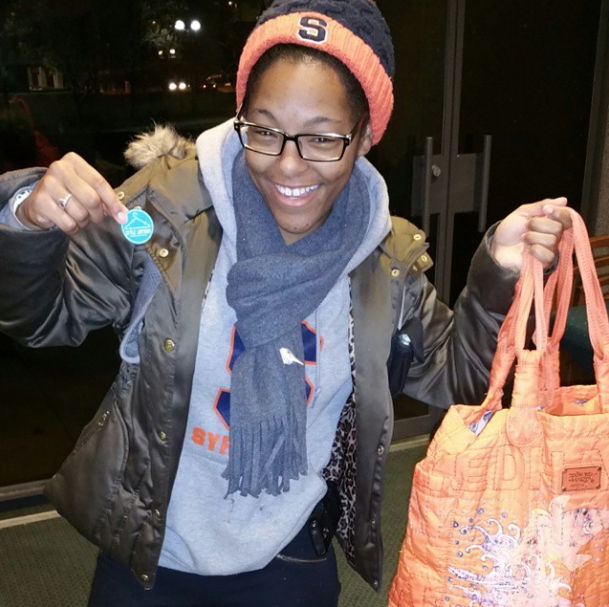 We recently had our last closet swap of the year on Syracuse University’s campus (flyers are below). We have noticed that we are building a small army of sustainable shoppers who consistently donate from their closets. We all enjoy finding clothes that we like, so we do all the hard work and bring other people’s closets to our guests. Those who have been attending our swaps know that swapping is a viable way to change up their style and recycle clothes from their closets. But why do we do all all of this? Sure, we do it to challenge people to chose sustainable fashion practices like swap instead of relying on trendy fashion. But we also host these swaps to connect students with members of the community. We are building a culture where we recognized that we can use fashion to touch the lives of others. The clothes that are donated from the university swaps are taken to the community where we host a program teaching girls about sustainable fashion. At the end of our community program, the girls receive a free shopping spree.This semester, we worked with Girls Inc. in Syracuse at the YWCA. 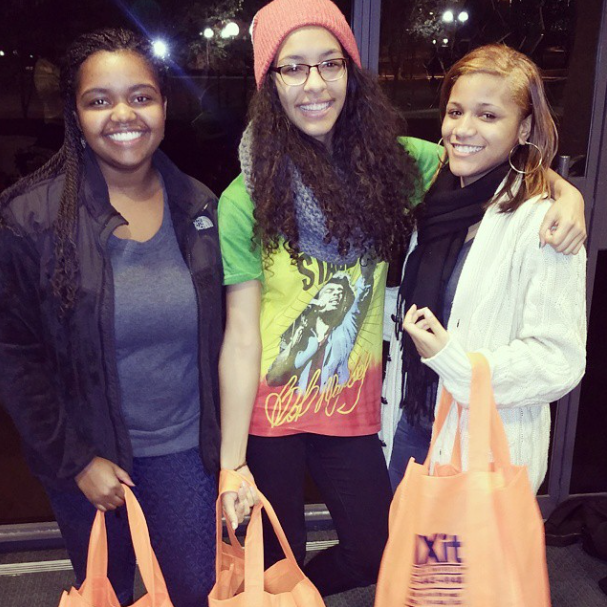 We had a wonderful time engaging with the girls and helping them find clothes to fit their styles and personalities. Some of the girls at the event. You can see their bright personalities! At the beginning of the year, we had a goal to give away 20 Style Lottery shopping sprees. We have 5 recipients from the Exodus House and 17 from Girls Inc. We did it!! And it was all thanks to you all. When you swap with us, you’re giving to girls in the community. Thanks to donations from our last two swaps, these girls got a free shopping spree at Girls Inc! The swap cycle is complete. You all have make what we do possible. Thank you for your generosity and willingness to try new things. 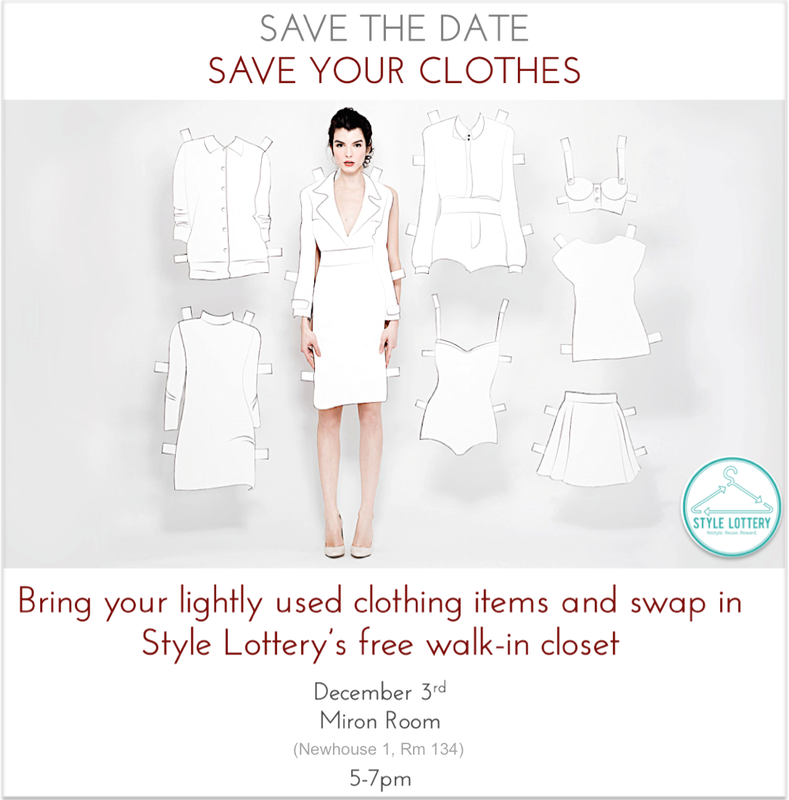 Style Lottery is converting a Syracuse University classroom into a a giant walk-in closet for the evening. Setting up for a closet-swap is a great design challenge. We typically have only a couple of hours to transform a classroom with desks and tables into a closet with racks and mirrors. I’ve always had an obsession with flash mobs and pop-up shops that appear and disappear overnight. 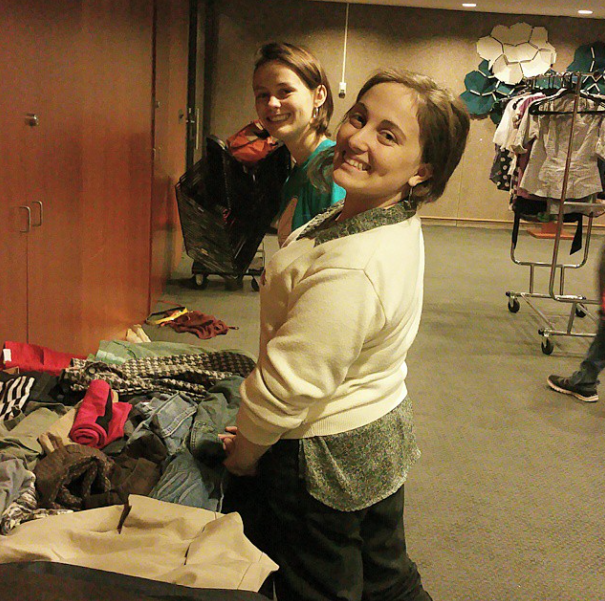 At our closet swaps, we have a lot of creative and hard-working volunteers who make our pop-up closet magic trick appear seamless. We have to “build” the closet and tear it down as soon as the event is over. Timing is critical, but my team is up for the task. Just to give you an idea of what point we’re starting from, the picture above is the before picture of the space we’ll be working in. Imagine this room with about 50 more chairs! We are grateful for every ounce of sweat and for every hand that makes our events a possibility. We can’t thank the Office of the Chancellor at Syracuse University enough for the grant they gave us to enable us to buy travelers racks (the type that folds flat) and other equipment for our swap! If you are interested in volunteering for the upcoming or any future swaps, please click here. 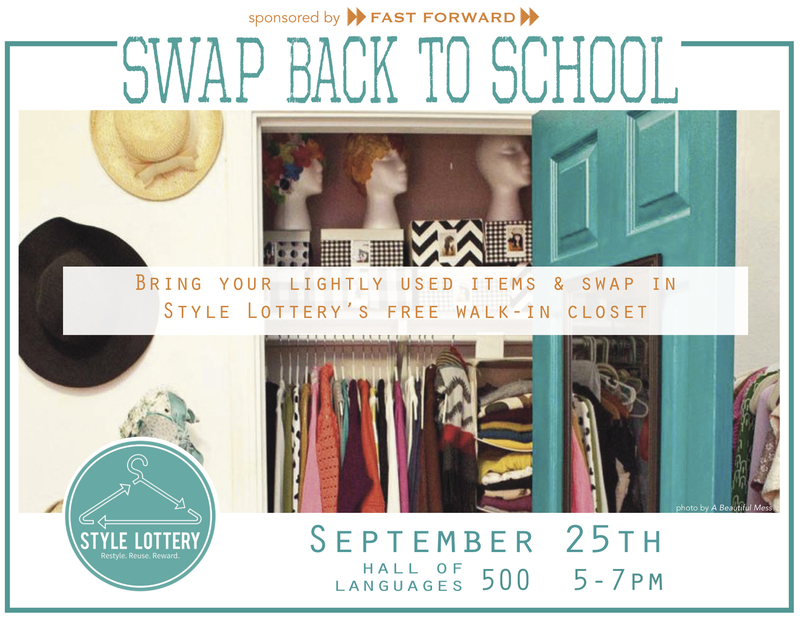 SWAP BACK TO SCHOOL is an event by Fast Forward grant recipient Style Lottery. The event encourages people to restyle, reuse, and reward​ with their clothing. ​Our guests bring at least 5 lightly used articles of clothing, shoes, or accessories to our closet swap event. Their items are then placed on the racks inStyle Lottery​’s giant walk-in closet setup and they can swap freely with one another. Remaining clothing from the swap is set aside to be donated to women in need in the community. In the past, Style Lottery has donated to organizations like The Rescue Mission and the Exodus House from the success of our swaps. The event is Thursday, September 25th at the Hall of Languages 500 from 5-7pm. Facebook event link is here.